One of the best things about using a Keurig or similar brewer is the amount of choice there is for drinking different styles of coffee along with other beverages like tea and cocoa. Here we look at one of the all-time classic coffee drinks to answer the question: which are the best cappuccino K-Cups? Back to basics – what is cappuccino? So how do we define “cappuccino”? Can a Keurig brewer make a cappuccino? Of course, most people know what cappuccino is. It’s a timeless coffee drink that’s been around just about forever. It’s the one that comes with lots of froth on the top and is a popular choice at any Starbucks or other similar coffee shops – although it’s now probably less popular than latte. But if we want to know which K Cups make the best cappuccinos, perhaps we need to know a little more about the drink to be able to judge. So let’s now think about the question, what is a cappuccino? 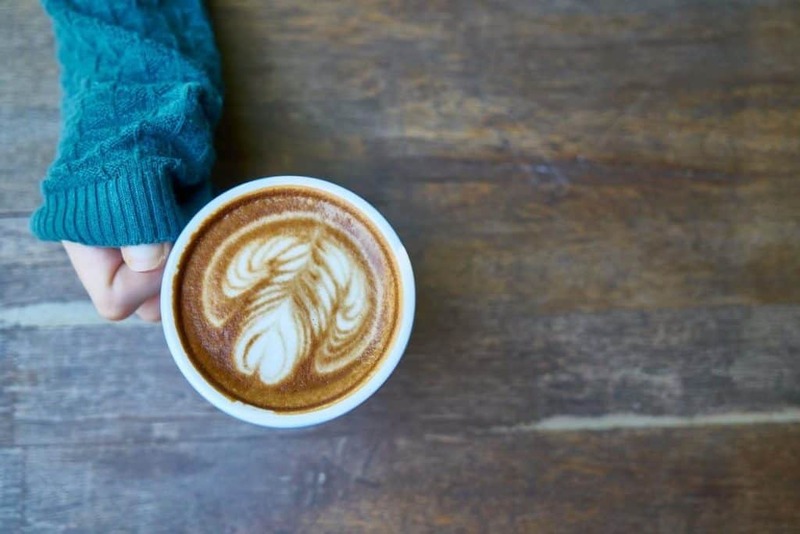 There have been many similar versions of coffee with milk from different countries, but what we think of as the modern cappuccino has been with us for around the same amount of time as the modern espresso. This is because, without espresso, a cappuccino is not possible. The cappuccino as we know it was born in Italy, probably sometime around the 1930s. It can possibly be considered a descendant of different versions of similar drinks that were already popular in Vienna in Austria. As espresso changed with the development of the machines used to make them, so did the cappuccino, which reached its current form in around the 1950s. So what is a modern cappuccino? A cappuccino is a drink usually made with two shots of espresso in a bowl-shaped cup followed by the same amount of warmed milk. This is topped with a layer of milk foam with a ratio of 1:1:1 espresso – milk – foam. Nowadays this can also be topped with chocolate powder, cinnamon or other similar flavorings. When it is poured, skilled baristas sometimes add intricate patterns to the froth known as “latte art” (it is called “latte art” since this is a common practice with lattes too). Check out this amazing video of some unbelievable latte art (1)! In Italy, the cappuccino is a breakfast drink and it would be considered strange to order one after about 11 am. 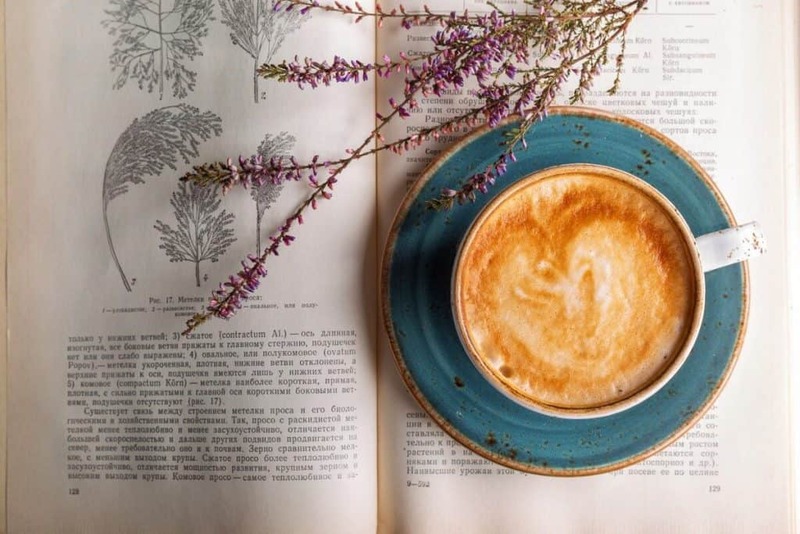 However, in North America, as well as many other countries around the world, cappuccinos are now commonly enjoyed at any time of the day. Before we move on, let’s just say a few words about lattes. How are they different from cappuccinos? Well, they are made in very much the same way, with milk added to a double shot of espresso and topped with foam. The difference, though, is in the ratios. We said that the ideal cappuccino ratio is 1:1:1 – whereas with a latte, there is much more milk than espresso – and then the foam only forms a thin layer on the top. This means there is more liquid in a latte since a cappuccino is one-third foam. This also means that a cappuccino should have a stronger coffee flavor than a latte since, in a latte, the coffee is more diluted by the milk. This is also the difference between cappuccino K Cups and latte K Cups – a good cappuccino K-Cup should have a stronger coffee flavor while a latte K-Cup should be milkier. Since Keurig machines and other brewers that brew using pods do not make true espresso and cannot make milk foam to go on the top, the drinks they produce can in no way be considered true cappuccinos. In fact, if you look at a K-Cup Cappuccino and compare it to a real cappuccino, this is immediately obvious. However, what these brewers can create are cappuccino-flavored beverages that taste quite similar to the real thing, produce a certain amount of froth on the top and are delicious drinks in their own right. If you are a Keurig user and you want a true cappuccino, you have two options: you can either buy a new machine that is capable of making real cappuccinos or you can go out to a coffee shop! But if all you want is a rich, creamy and smooth coffee drink, there are plenty of good K-Cup options that make good substitutes. 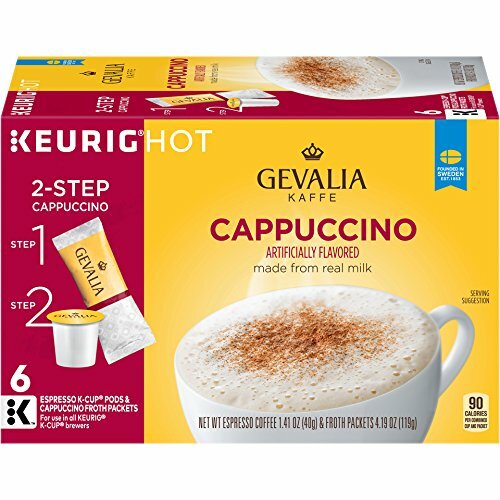 If you are happy with K-Cup cappuccinos but you want something a bit closer to the real thing, there is still something you can do that won’t cost you too much money. Espresso machines allowed the creation of the modern cappuccino because making cappuccino requires espresso, but also because of the steam wand used to froth the milk. Since Keurig and other K-Cup brewers don’t have a steam wand for frothing, there is no way of making foam. Here’s a video of how it’s done with a real machine. However, if you’re a big fan of frothy cappuccino, you can simply buy a separate frother that you can use to prepare foam from warm milk and then spoon it onto your K-Cup cappuccino. Of course, it still won’t be quite the same as a coffee shop cappuccino, but it will be just a little bit closer. You can even sprinkle on some chocolate powder for a little extra luxury and indulgence – and that authentic coffee shop effect. 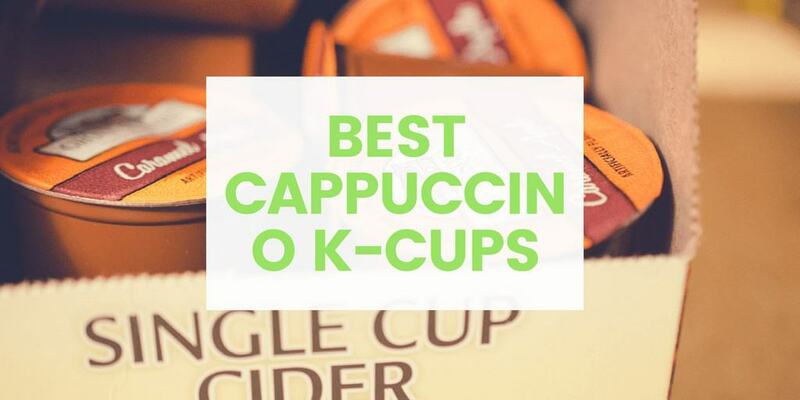 Here are our top picks for the best K-Cup cappuccino pods. 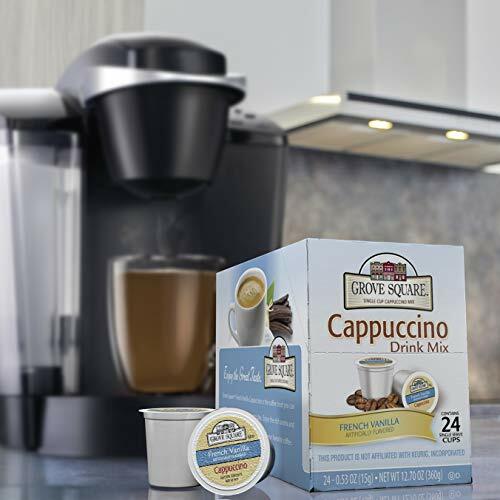 Grove Square is a company that makes some of the most popular cappuccino K Cups for Keurig and other similar brewers. This variety pack offers the chance to sample three of their delicious flavored cappuccino pods in one box. Included in the pack are French Vanilla flavor, hazelnut flavor, and caramel flavor. They are ideal for people who enjoy a different flavored brew each morning rather than just drinking the same thing every day. 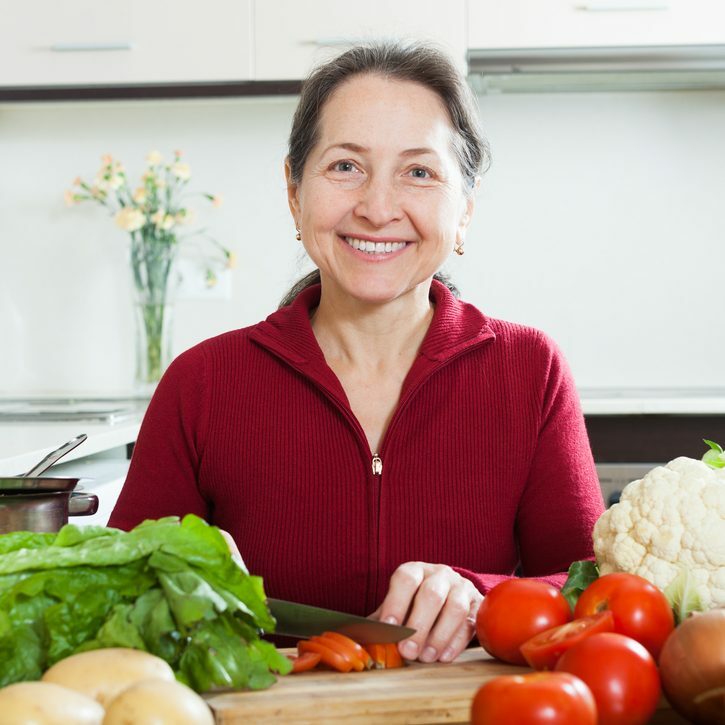 They are compatible with all the original Keurig machines and Keurig 2.0 brewers. They are certified kosher. Some of the most fashionable coffee drinks over the past few years have been creations like flavored cappuccinos, lattes and macchiatos. One of the best flavors that combines perfectly with coffee is vanilla, and with these French Vanilla K Cups, you can now enjoy it at home too. If you want to wake up to the energizing aroma of freshly-brewed coffee mixed with the enticing sweetness of vanilla, you could do a lot worse than giving these pods from Grove Square a go. As with all Grove Square pods, they work with first-generation Keurig machines as well as the 2.0 brewers. Certified kosher. 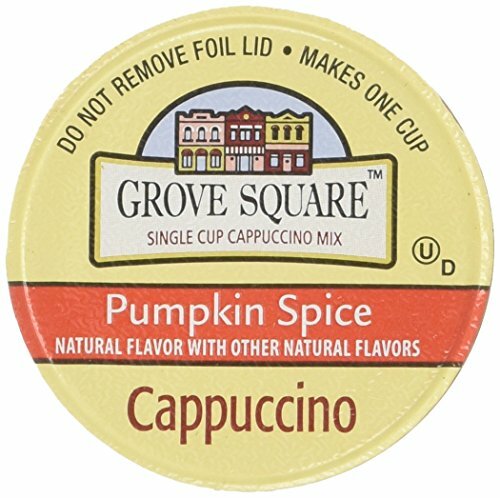 For those who want to try something a little different, these pumpkin spice pods – again from popular company Grove Spice – could be an intriguing option. Everybody has tried flavors like caramel, vanilla and hazelnut – but what about cappuccino that tastes like pumpkin pie? To us, that sounds too interesting to pass up, and for the more adventurous, we’re sure it has your curiosity piqued too. Again, Grove Square pods are compatible with first-generation Keurig brewers and all 2.0 machines. They are certified Kosher. For those who want as close to the real cappuccino experience from their Keurig machine as possible, these pods are a great solution. The coffee in the pods is authentic espresso roast from 100% Arabica beans for the true coffee shop taste. But the innovation comes with the separate packets of powder you add to the drink after it’s brewed to create a more genuine froth made from real milk. While it’s still not a real coffee shop cappuccino, it’s a much closer approximation than most pods can offer and is an ideal option for those who love a luxurious morning K-Cup cappuccino. These pods offer another option for those who enjoy a luxurious and indulgent morning cup of vanilla-flavored cappuccino. 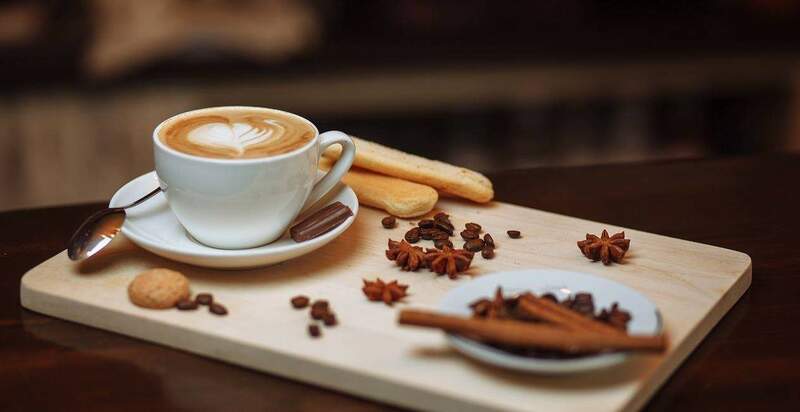 They are naturally and artificially flavored, and have a delicious sweet and creamy cappuccino taste, perfect to help you start the day the right way. 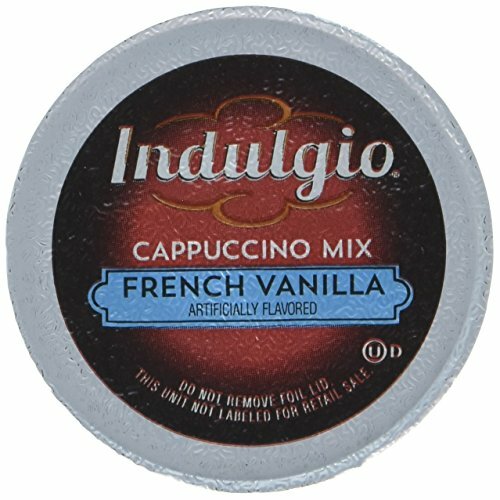 Indulgio K Cups are compatible with most Keurig-type brewers and should work with Keurig 2.0 machines. The flavor is very sweet and will appeal to people who enjoy sugary coffee beverages. Perhaps these are not the best for people who like a little less sugar. As we noted earlier, Keurig-style brewers can’t really make true cappuccino, and what they make can only ever be an approximation of the real coffee shop drink. That said, all of these cappuccino K-Cup brands make delicious cappuccino-style drinks that cappuccino fans will enjoy. 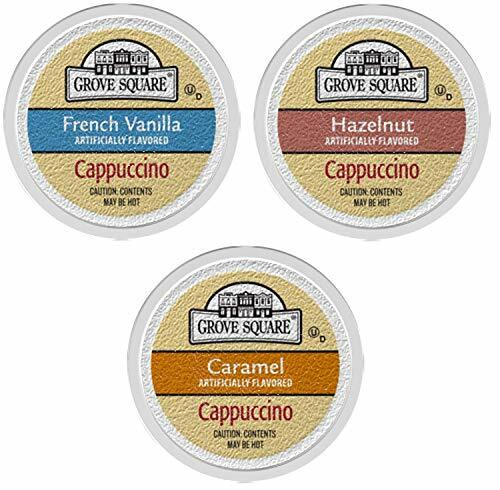 Many of the best cappuccino K Cups have different flavors, including old favorites like vanilla, caramel and hazelnut – or more original flavors like the pumpkin pie ones we reviewed here. This is one of the joys of using a K Cups – there are always so many new and exciting flavors to discover. Do you use K Cups to brew coffee? Have you tried cappuccino pods? What about other drinks like lattes and macchiatos? How do you find them? How do they compare to the real thing? Let us know your thoughts – we always love hearing from you. And if you enjoyed reading, why not share?